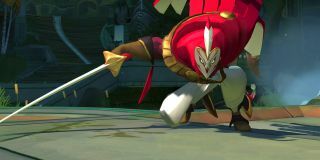 Gigantic hands-on and interview: MOBA 2.0? Tyler and I had an opportunity to play a round of Gigantic at PAX East. Motiga's 5-on-5 multiplayer game bears some resemblances to Smite and other MOBAs, but it also has some enormous differences. Literally enormous, in one case. To learn more about how Motiga sees Gigantic fitting in alongside an ever-growing genre of competitive games that includes everything from League of Legends to Overwatch, I spoke with Motiga CEO Chris Chung. After that, I pulled Tyler in front of the camera to talk about what we thought of Gigantic. Keep an eye out for our ASUS ROG G751 laptop giveaway after PAX East—we're collecting signatures from everyone we interview for a one-of-a-kind prize.